The KTM 1290 Super Duke was announced as the Pirelli SA Bike of the Year at the opening of the Association of Motorcycle Importers and Distributors (AMID) show at Nasrec recently. By LANCE ROTHSCHILD. When the panel of 14 motorcycling journalists assembled at Mike Puzey’s Biker’s Warehouse, the bikes were all lined up ahead of the departure for the Sabie/Hazyview area. Two days of riding and testing saw nine bikes put through their paces over long highway sections, sweeping mountain passes and very twisty back roads. The two dual-purpose (or, as I prefer, adventure) bikes were also subjected to testing on a small off-road section in the forests near Hazyview. In fairness, I didn’t break the speed limit at all on the rides – it was already broken when I got there. For the second year in a row, the Pirelli SA Bike of the Year contest was a close-run thing with mere points separating the first and second places. One interesting trend emerged, with the top three places all occupied by “naked” (without fairings) bikes. South Africans have typically shown a disregard for naked bikes in the past, with a distinct preference for their fully-dressed siblings over the years. This is in direct contrast to the trend in Europe, where naked bikes are very popular. I must confess to having developed a linking for naked bikes over the past few years, having initially been more favourably disposed to the fully-dressed sportier bikes. I think that it was an excursion to a fairly tight racetrack where I got to be more comfortable with naked bikes, and I know that as an everyday bike, I would prefer a naked bike for a commute – predominantly due to low-speed manoeuvrability and better all-round vision – over a typical Superbike. I think that the manufacturers and designers have improved their engineering skills considerably, as I was impressed with the low level of wind buffeting typically associated with naked bikes. So how did all the bikes fare on the shootout? The Z1000 is an easy bike to ride and my only regret is that I didn’t spend more time riding it. Like last year’s Z800, it offers an excellent all-round package and is really quick. It rides quite intuitively and although many of my colleagues complained that it was a hard ride, I believe that set up appropriately, it will provide the rider/owner with many happy kilometres. I enjoyed riding this on the tight and twisty roads between Sabie and Hazyview, where I found the handling to be predictable, comfortable and accurate. The brakes were very good and the bike is probably going to emerge from this shootout somewhat under-rated. One has to take into account the vast improvements made by Kawasaki over the last few years – after all, they are the reigning WSBK champions. Whilst the V-Strom is a vast improvement on its predecessor, and whilst it is a very handsome bike, and whilst its on-road manners are superb, I was very disappointed with its off-road character, particularly the fact that the ABS cannot be switched off. On the road it is an excellent ride and soaks up the distances comfortably with the screen providing ample wind-protection. The seat is very comfortable for a long stretch and the engine very willing throughout the entire rev-range. In its category, it is very well priced and for a daily commuter this is a great option. Off the tar, it is more suited to travelling dirt highways and would be a handful on twisty sections (like the Prince Alfred Pass or the Baviaanskloof). This was the most delightful bike of the entire bunch because it punches so far above its weight category. The MT-07 is truly the easiest bike of the lot to ride and gives excellent feedback to the rider. It will suit a beginner/newcomer as well as a more seasoned/experienced rider. Handling on this bike is superb and the engine is sweet and willing. Fuel range may be a tad limiting, but we were not holding back when riding these bikes. I truly enjoyed riding this bike and it has a huge “grin factor”. I could definitely own one of these for regular town commuting (if I lived in the town again). It will also provide a lot of fun on the track, and may surprise some of the superbikes, particularly on the more twisty circuits. I loved the precise handling of this bike. It has the cachet of being a Ducati and has immense presence, even when standing still. It wins the prettiest bike of the lot, by a country mile, but it is not an everyday ride in that the riding position is a little too aggressive for commuting in heavy traffic, and it doesn’t like being ridden slowly. I was definitely in the wrong riding clothing for this bike and couldn’t get into “the bubble” and thus got very strong wind buffeting when riding it. That being said, it is still a very desirable bike and the handling and the speed absolutely blew me away. On the return trip to Randburg, I had great fun on the N4 riding alongside, and then blowing away, an Audi R8 on this machine. This is an excellent bike and it does everything you ask of it (and very well too – I might add). It is a great value-for-money option and would be excellent as a commuter and for the odd weekend breakfast run or track day. Whilst I really liked the MT-09, it was a little inferior to the more brutish and muscular bikes that made it into the top 4. It is a bike that would be very easy to live with and would suit a biking returnee very well. BMW have raised the bar significantly with this bike. It is the most comprehensive package of all the bikes in the mix, being highly capable on-road as well as off-road. When going off-road, the bike needs the right tyres, though, as I was getting quite a lot of wheelspin, which was actually a loads of fun. It will sell very well in this market (as always) although the price point is somewhat limiting. This bike just does everything very well, and although it is huge and can be a little intimidating, handles slow riding very well too. Its height could be a drawback and its sheer presence makes it a little imposing. It’s most certainly not a bike for newbies or beginners. This is a great bike with superb handling. The motor pulls all the way through the rev range and it is an easy bike to get along with. It has true Italian flair and precise handling. It’s quite a close call between this and the KTM as they are both very good bikes, with the KTM having a little more muscle at the top end of the rev range. At one stage, for me this was going to be the clear winner. It is an excellent bike and a delight to ride. Just the howl of the engine when you are on-board makes this a great ride. Power is excellent, handling very precise and the quick-shifter makes getting going an absolute delight. It will make a good commuter, and still provide excellent fun at a track-day or on a breakfast run. 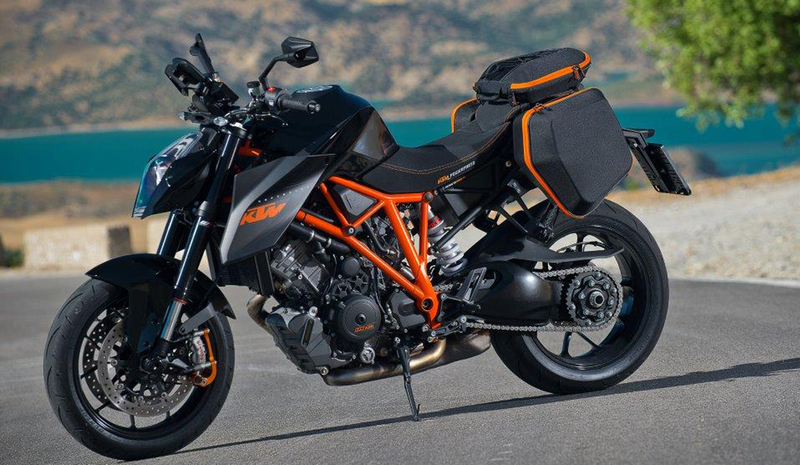 Main photo: The Winner, KTM 1290 Super Duke.